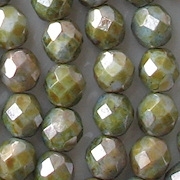 White beads with a green mottled luster coating. 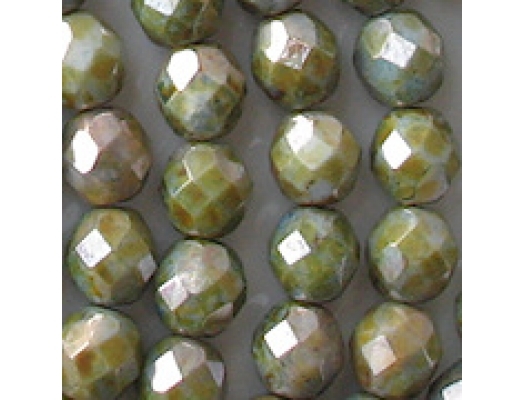 I see light aqua under the coating, so the beads may have been coated three times, first with light aqua, then with green, and then with a mottled brown luster coating (but that's just a guess). The coatings are not synthetic. 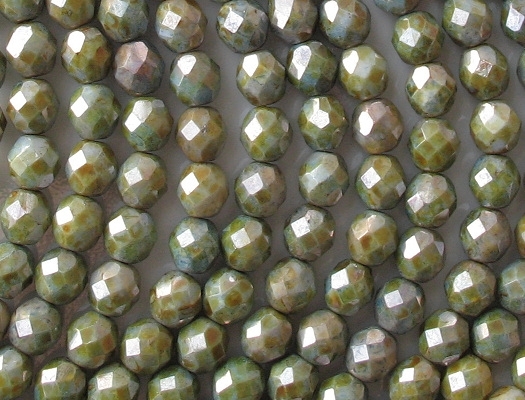 The beads appear to be in good shape, but fire-polished beads always have some imperfect facets. In fact, when examining the batch purchased in December, 2013, I noticed that many facets have shallow grooves in them, which is an indication that they were faceted with worn blades. Nonetheless, they look good to me. The picture was taken by the supplier.